The eldest of four children, I was brought up on a farm in Northamptonshire and horses were always part of my life. My mother was an event rider and my father worked for Tattersalls, the bloodstock auctioneers. My parents had a hunter livery yard and a hunter dealing business, and my mother and I had a small pony dealing business. 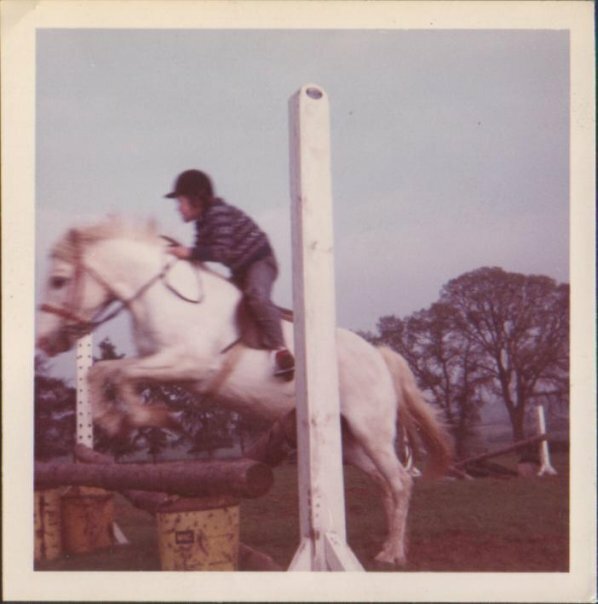 I graduated from riding Joey, a fiendish shetland to Smokey, a wonderful old grey pony who introduced the whole family to hunting and jumping. After that came the legendary Mrs Plum who was the most wonderful hunter and prolific show jumping winner, by which time I had started riding the young dealing ponies and the young hunters who my father bought in Ireland every summer while he was looking at yearlings for the Tattersalls’ sales. My mother had trained with the great Lars Sederholm, and so although I was never aware of having lessons with her, I expect my grounding was very correct. Together with learning quick reactions and stickability by hunting a wide variety of young horses. The Grafton Pony Club was lucky enough to have Delia Cunningham, a famous dressage rider and now one of the owners of William Fox-Pitt’s Oslo, as our chief instructor. I was lucky enough to be in teams with Judy Hancock, Anne Marie and Nigel Taylor, Philip Herbert and Douglas Weymouth, and to be in the winning team at the Pony Club Championships in 1979. Sadly when I was 16 my mother died. As a result I owe a huge debt to our great family friend Peter Fenwick and my mother’s head girl Christine Jackson, who saw me to the end of my Pony Club Career and through my first year of what was then BHS eventing. After leaving school, and dropping out of university, I lived and worked in London for seven years, marrying Mark and moving to Sussex where Anna & Sophie were born in 1987 and 1989. Riding took a back seat during these years, although I did hack out for friends. In 1990 used the money my Mum had left me to buy a horse of my own. This was Spring Spartan, an anglo arab, and what a fantastic buy he was. In just two seasons we went from nothing to 7th at Osberton CCI**. Spartan was then sold to Fiona Chesterton (nee Ranson) who was placed on him at Braham twice and rode him in the Young Rider Europeans at Blenheim. Spartan lived a wonderful old age with Fiona and was only put down last winter. I had less success with Spartan’s successors until I bought Mossfort (aka Hungry) from Michael Drea. At 15hh he might not have seemed to most obvious star, but what he lacked in height he made up for in courage and opinions. Hungry really rekindled my love of competing, and with help from Jo Marsh-Smith I learned so much about not only riding him, but producing young horses in general. Hungry was fairly competitive show jumping and helped me win the Intermediate section at Eridge Horse Trials. I completed four three-day events with him, two abroad and Windsor and Hartpury CCI**. Hungry went on to enjoy great success with Helen Dunning who completed Blenheim CCI*** and Bramham CIC*** double clear and was placed in the advanced at Weston Park on him. Hayley Wright then enjoyed two years with him at 2* level, and having retired at 20, at 21 took up unaffiliated show jumping up to 1.10 level, before retiring again. He is still living happily in Yorkshire aged 26 looking like a 5 year old. In 2005, having sold Hungry and sadly lost his replacement to an injury, I decided that I ought to have a back up plan as I was getting a bit old to ride young horses. Having previously dropped out of Exeter University in 1981, I did an Access to Higher Education Course at Mid-Sussex College in Haywards Heath and then embarked on a Psychology degree at UCL in London in September 2006. Having got my 2:1 I worked as a Research Assistant at the Institute of Psychology for two years. I worked as Equine Manager at Old Lodge Stud for 2012/2013 and now work part-time at Breen Equestrian in their office overseeing their website, updating social media and helping Chloe with the very busy admin. Alongside my work for Breen Equestrian I have helped set up websites for Michael Quirke, David Simpson, Biba McCaul, and Greg le Gear and help some of the working pupils with their own marketing. While I was studying for my degree I changed from eventing to show jumping and started training with Shane Breen, who has given me so much help, changing my riding and increasing my confidence. Since starting training with Shane I have produced and sold Ordinary Boy, Castleview Bouncer, Homer, Wayfer, Little Penny. Espirito Santo and Luendi, and a few other hunters and youngsters. I now have an eleven year old mare Doonaveeragh Emma, who was successful in young horse classes and progressed through being prolifically successful in CSI1* Grand Prix to competing in our first 1.45 Longines Ranking Classes and being very successful in CSI2* 1.40 classes in 2018. 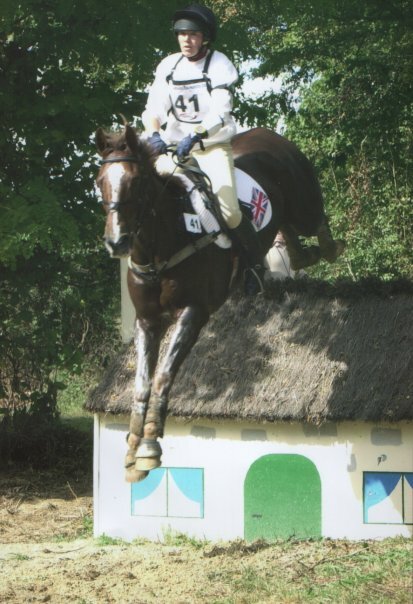 She was also placed in very good company in the British Showjumping National 1.30 Championship in August 2018. She is undoubtably my horse of a lifetime. I have a lovely 8 year old, Kvint, who has recently stepped up to 1.30 and 1.35 classes, and is now regularly placed at CSI2* level. I am producing two young mares; 5 year old Askeaton II, bred and jointly owned by Breen Equestrian. who was broken in December 2017 and is now jumping 1.10 and 5 year old classes., she made her international debut in the CSIYH1* at Bonheiden in September; and 4 year old Hurricane Heidi who, despite spending seven months of the year growing in the field, won her first British Showjumping prize money and is now skipping round 1m classes. I have a fantastic team with me at home: Steff Gibbs has worked for me for five years, and is here every afternoon. She knows all the horses so well and her attention to detail and care for the horses in absolutely unparalled, Steff is also an excellent show groom, the horses are always in the right place at the right time and looking absolutely perfect. Camilla Plass has been with me for a year, and is here every morning helping me with yard and the exercising. Camilla is a talented and sympathetic rider and she has been an invaluable help with the youngsters over the past year; and last but by no means least, Izzy Pennington, who helps me on Saturdays. Izzy has been a tremendous help over the summer, both at shows and at home. She is a lovely rider and we will really miss her when she goes off to University in September 2019. We have fantastic veterinary care with the fantastic Cinder Hill Equine Clinic very close by, and the added expertise of Ed Lyall from Sussex Equine Hospital who is in particular an expert in lameness/soundness in competition horses. We also have the very best farriers, the Casserleys and Caitlin McCaffery the equine Chiropractor completing our team. I also have a good group of pupils from eventing, show jumping and team chasing who I very much enjoy teaching. We are lucky enough to live in a most beautiful part of England, with Ashdown Forest, Sheffield Forest and the South Downs within easy reach, and have lovely facilities at home, so producing young horses and a job in show jumping is the best of all worlds for me.